In his second season with time in the majors in 1988, Jim Eppard wasn't a regular with the Angels. But he was still with the Angels. Eppard wasn't complaining, The Los Angeles Times wrote. "I know my role here," Eppard told The Times. "I'm the left-handed pinch-hitter off the bench. My job here is to stay ready." Eppard's role that year resulted in him getting into 56 games for the Angels. Eppard, though, got into just 18 more major league games over the next two seasons, finishing out his major league playing career. Two decades later, Eppard started his new major league career, as Angels hitting coach. Eppard was named to the position, returning to the majors after a long career as a coach in the minors, in May 2012. Eppard's baseball career began in 1982, taken by the Athletics in the 13th round of the draft, out of the University of California, Berkeley. Eppard played that first year at short-season Medford, moving to single-A Modesto in 1983. He first made AA Albany-Colonie in 1984, then AAA Tacoma in 1986. He moved to the Angels for 1987, and made his major league debut that September. For the Angels, Eppard got into eight games, picking up three hits in nine at bats. Eppard returned to the Angels for those 56 games in 1988. He hit .283 in 113 at bats. Coming off of that season, Eppard had hopes of making the Angels out of spring training 1989. Instead, it was back to AAA. "I'm not a crybaby or a pouter," Eppard told The Times. "I'm a survivor. I'll just keep plugging away." He eventually did get back to Anaheim in 1989, getting into 12 games, with 3 hits in 12 at bats. Eppard signed with the Blue Jays for 1990, getting into just six games with Toronto. He spent the rest of the year at AAA Syracuse. 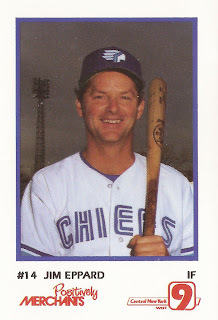 Eppard continued playing in the minors and independent ball through 1993, ending his playing career. By 1996, Eppard had begun his coaching career. He started as manager for the rookie Arizona Rockies. 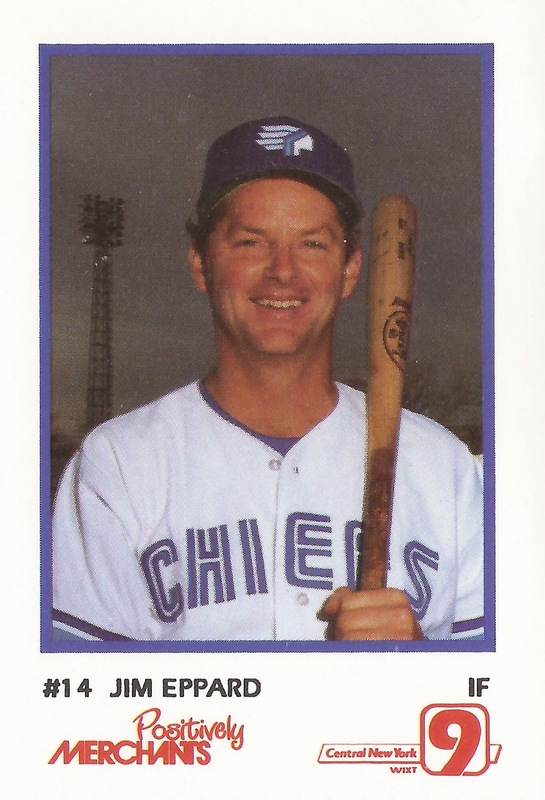 He hit AAA in 2000, as hitting coach with Colorado Springs. In 2003, he became hitting coach for AAA Salt Lake, continuing there into 2012. "One of the things I like about this level," Eppard told The Salt Lake Tribune in 2010, talking about hitter Hank Conger, "we're constantly teaching. We're constantly on our toes figuring out how to help make guys like him better." Eppard stayed with Salt Lake until May 2012, when he was named hitting coach for the Angels in Anaheim, taking over for an ousted Mickey Hatcher. "I think Jim's a terrific hitting instructor," Angels manager Mike Scioscia told ESPNLosAngeles.com after Eppard's hire. "He's got a great understanding of hitting. He's a great teacher with a lot of the same attributes that Mickey had and hopefully he'll keep getting these guys in their comfort zone."